Thank you for your generosity and support for our mission at Hope for the Child! There are several ways you can help. Donate online using PayPal! It's quick, easy and secure. For additional information, please contact us at HopeForTheChildInfo@gmail.com. Partnering with HFTC to sponsor a child is one of the most meaningful ways you can make a connection and a big difference to a child's life at Arise N Shine Community Academy. Your tax deductible contribution of $30 per month or $360 per year will help provide for educational assistance, medical checkups and food for your child. Sponsoring a child will bring access to resources for the children and spiritual fulfillment for you as well, because you know that you are making a difference. Above all, your child will be able to sustain their enrollment and continue to belong to a family that loves and cares for them daily. Click on the Donate button above to make a commitment and start sponsoring a child today. We all remember the teachers that made the biggest difference in our lives when we were kids in school. Teachers are a big part of a child's learning process. 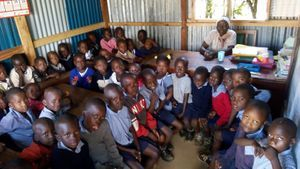 A good teacher could be the turning point in bringing light and hope to the success of a child at school and for $120 per month, you can help make sure that our teachers can come give their best at the school while caring for their own children at home. We want to make sure that the children are learning in a stable environment. In order to keep good teachers around, we have to make sure they are paid every month. So click on the Donate button above and sponsor a teacher today! At Arise N Shine Community Academy, food is critical to our daily operations because most of the children come early and they come hungry. When they are hungry they cannot learn. We at HFTC, recognize that, so we make it a priority to provide at least one meal per day to all 120+ children that are enrolled. 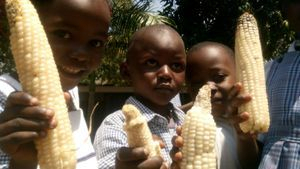 The food we provide daily includes maize, beans, rice, bananas and cabbage. We need your help to make sure we can continue to provide for the nutritional needs of the children. $1000 will provide for all the children's needs for one month. Please consider partnering with us to feed the kids. Click on the Donate button above to be a sponsor today. 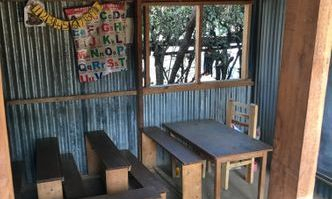 Just as any farmer needs tools, our students and teachers need a steady supply of basic stationary and supplies such as text books, crayons, pens, pencils, pencil sharpeners and chalk to facilitate learning. Arise N Shine Community Academy needs your help to provide these basic tools today. Click on the Donate button and make a difference in the classroom experience today. Possibly the easiest way to help our cause: Do all of your internet searching using the goodsearch.com search engine! If you select us as your non-profit choice, they donate 10 cents to us every time you search! It all adds up!